Ed, Ron and Producer Bill recap the show's rockin' first year and introduce the play-along bracket for our annual Tournament of GOATs! 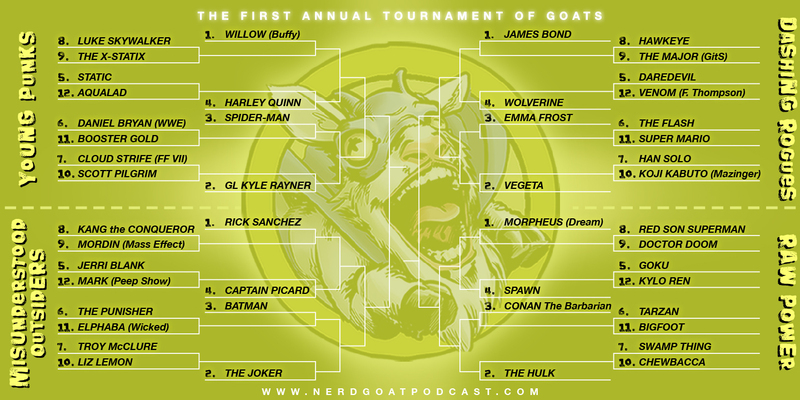 Welcome to the first annual Tournament of GOATs! We're inviting our listeners to help us sift through a year's worth of amazing, deep-dive episodes to decide the One GOAT to Rule Them All! Click and save the bracket above, fill it in with your choices, and share on social media! Ron and Ed talk to Laura Crawford about her Nerd GOAT: Mark from Peep Show! Get ready to meet the GOAT of cringe comedy, and we don't say that lightly. Ron and Ed talk to comics scholar Jeff May about his Nerd GOAT: The X-Statix! Come for crazy X-characters, stay for incisive commentary on the state of fandom.